Range: England, Central Europe, Southern Russia to China and Japan. Habitat: During breeding Smews are located in small lakes and ponds. However, during the winters they are found in lakes, rivers, and estuaries. They also nest in holes in trees in the forest. Diet in the wild: Fish, insect larvae and shellfish. 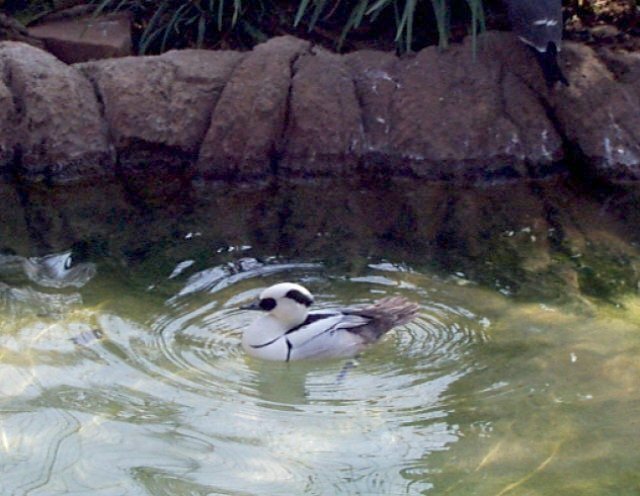 Diet in the zoo: Smew breeders use live food such as mealworms and minnows. Location in the zoo: Near the waterfowl area, close by the aquarium. Black face and a V-shaped black patch beneath the crest. Its back wings and buttocks are dark grey to black. The breast is white and has two lines on the side that extend forward from the back. Has a thick pointed bill with a jagged edge. Females are 15 1/4 inches to the end of the tail. Females have a brownish head and a white cheek and chin patch. The breast is light grey and the rest of the body is dark grey. Smews are very rare in America. They have been sighted in New York and Rhode Island. A Smew's breeding season is May to early June. During breeding season Smews live in freshwater lakes and rivers in forests in northern Europe and Asia. They breed in their second year. Other names for Smews are the White Nun and the Weasel Coot. Smews are the smallest species of mergansers or Sawbills. It is one of the three species of Sawbills that occurs in Europe. Sawbills are diving ducks with a hook at the tip of their bills. Smews are small enough to nest in holes used by black woodpeckers. 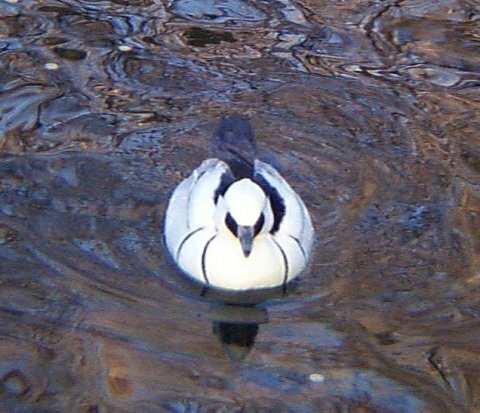 An entrance hole size for a smew is 3 1/2 to 4 inches. Like other Sawbills, Smews have pointed bills with jagged edges for catching and holding on to the prey (fish). 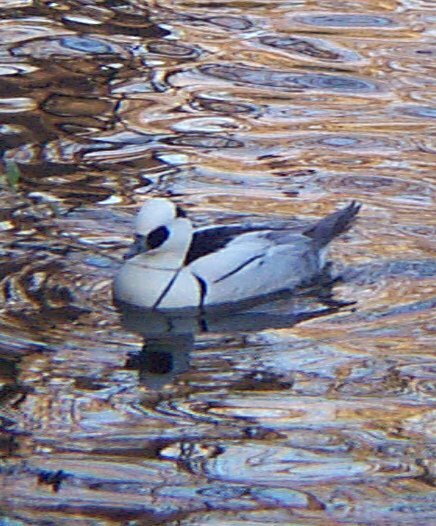 Smew, Mergus albellus. 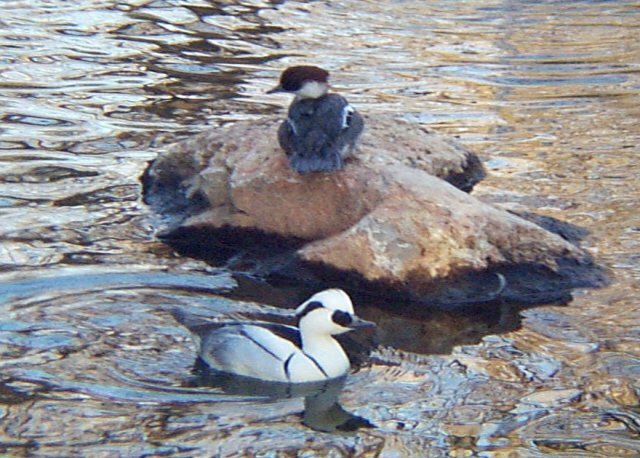 The Game Bird & Waterfowl pages <http://www.gbwf.net/waterfowl/smew.html.>.